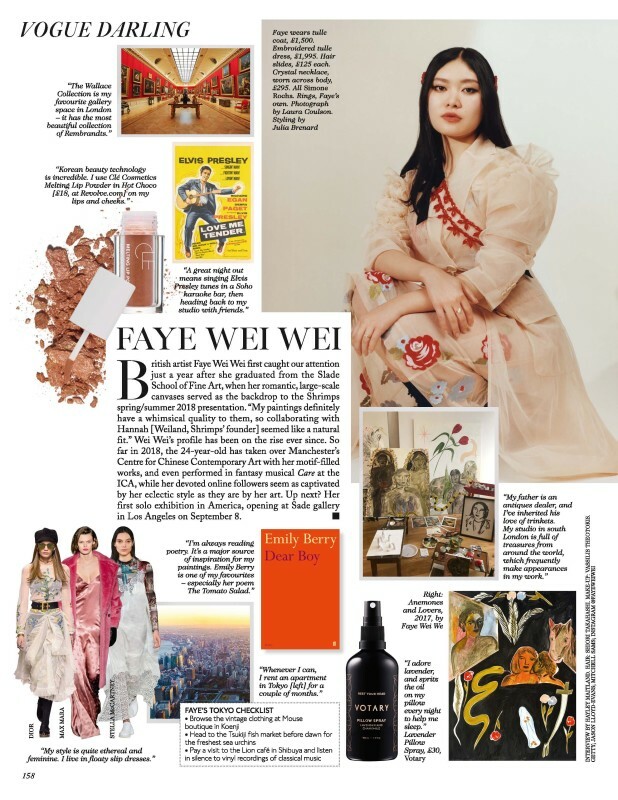 In the September issue of British Vogue, Faye Wei Wei is the latest rising star to step into the role of Vogue Darling. Bitish artist Faye Wei Wei first caught our attention just a year after she graduated from the Slade School of Fine Art, when her romantic, large-scale canvases served as the backrop to the Shrimps spring/summer 2018 presentation. "My paintings definitely have a whimsical quality to them, so collaborating with Hannah [Weiland, Shrimps' founder] seemed like a natural fit." Wei Wei's profile has been on the rise ever since. So far in 2018, the 24-year-old has taken over Manchester's Centre for Chinese Contemporary Art with her motif-filled works, and even performed in fantasy musical Care at the ICA, while her devoted online followers seem as captivated by her eclectic style as they are by her art. Up next? Her first solo exhibition in America, opening at Sade gallery in Los Angeles on September 8.